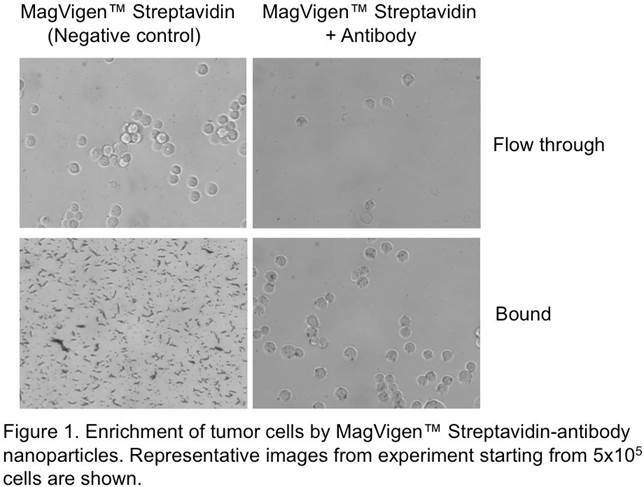 MagVigen™-Streptavidin are ideally used together with mouse antibody for isolation of cells (e.g. CTCs, stem cells) from a mixture of cell population obtained from tissues or organs. The isolated cells are viable and can be further cultured or used for downstream molecular analysis such as mRNA isolation and RT-PCR. Cell separation with MagVigen™ nanoparticles eliminates the use of columns, so cells are not exposed to the mechanical stress from passing through the column matrix. Magnetically separated cells are highly purified and retain their viability, ideal for downstream applications. Cat# 21005C: MagVigen™- Streptavidin are provided in phosphate buffered saline (PBS) containing 0.02% NaN3, 0.02% BSA. pH 7.4. Each vial contains 1 ml of solution with particle concentration of 2 mg/ml, which is enough for binding 109 cells. All materials except the magnet should be stored at 4°C. This protocol provides a general guidance for enriching 105 -106 cells using MagVigen™- Streptavidin magnetic nanoparticles. Please adjust the amount of reagents for specific application. Gently vortex or pipette the MagVigen™- Streptavidin magnetic nanoparticles in the vial before use. Aliquot 20-50 μl nanoparticle solution for enrichment experiment. Note: 20-50 μl is generally sufficient for the enrichment of 105 -106 cells. Cell capture efficiency can be affected by factors such as frequency of target cells in the cell population, density of antigen/epitope expressed on the cell surface, and the antibody affinity. Adjust the amount of nanoparticles accordingly. Wash nanoparticles with 500 μl of Washing Buffer twice. Separate the nanoparticles from the solution by placing the magnet on the side of the tube for 1-2 min and remove the supernatant carefully (with magnet still on the side). Add 1μg-2μg biotin-conjugated antibody (in a volume of 100- 200 μl ) to the nanoparticle and incubate for 30-60 minutes on a rotator. Note: 50 μl nanoparticles could bind ~2μg of antibody. Wash nanoparticle-antibody conjugates with 500 μl Washing Buffer twice to remove unbound antibody. Resuspend the nanoparticle-antibody conjugates in Washing Buffer (50 μl ) and add it to the cell sample to a total volume of 0.1-0.5 ml. Note: Elution buffer can be used to elute the target protein or cells from MagVigen™-Streptavidin magnetic nanoparticles. 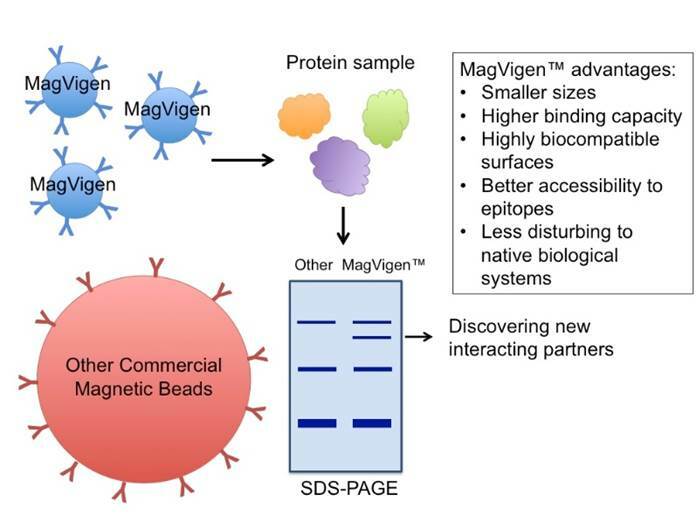 MagVigen™ nanoparticles enable identification of new protein- protein interactions through immunoprecipitation assays, where the MagVigen™ streptavidin biotin-antibody complex can be used to isolate particular proteins of interest or protein complex from assay samples, e.g. cell lysate. The immunoprecipitated proteins can be further analyzed by electrophoresis, protein staining, and mass spectrometry. MagVigen™ nanoparticles are much smaller than conventional micro-beads. This feature allows for better accessibility of the nanoparticles to the antigenic epitope and for less disturbance to the native functions of proteins or protein-protein complexes. In addition, the surfaces of MagVigen™ nanoparticles are uniquely coated to reduce non- specific interactions with cellular proteins and other biomolecules. This feature allows for a more specific “pull down” of real protein complex targets. Note: A clear precipitate containing dark brown colored nanoparticles should become visible on the side of the micro- centrifuge tube. Add 2 μg of biotin-antibody (or recommended amount following company protocol) to the tube containing cell lysate. Add 50μl of pre-washed MagVigen™ nanoparticles to the tube. Rotate for 2 hours at 4°C. Aliquot 50 μl nanoparticle solution for enrichment experiment. Note: 50 μl is generally sufficient for the enrichment of 1-10×105 exosomes. Exosome capture efficiency can be affected by factors such as frequency of exosomes in the sample, density of antigen/epitope expressed on the exsosome surface, and the antibody affinity. Adjust the amount of nanoparticles accordingly. Add 500 ng biotin-conjugated antibody (in a volume of 100-200 μl ) to the nanoparticle and incubate for 30-60 minutes on a rotator. Note: 50 μl nanoparticles could bind ~200 ng of antibody. Incubate the nanoparticles with pre-enriched exosome sample on an orbital shaker for 2 hours or overnight at 2°C ™ 8°C. After incubation, use a magnet to separate the nanoparticles (with bound exosomes) from the solution, and carefully remove the supernatant. Wash the nanoparticle-exosome complex with 500μl Washing Buffer. The exosome bound nanoparticles are now ready for exosome lysis, gel electrophoresis, and western analysis.